We asked: In your opinion, in what areas does our industry require more training opportunities for personnel? As our industry ages and develops, we become more focused on being proactive and being effective and efficient with the assets available to us. 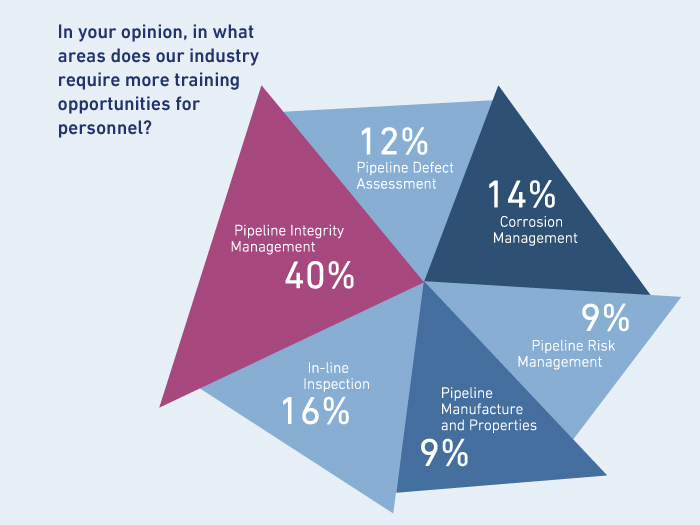 With aging pipelines, more cost-efficient mindsets, and a central position in the public eye, our industry focus must continue to develop increasingly comprehensive integrity management systems. In an effort to invest more knowledge-sharing in integrity management, this edition of our “Facets” newsletter highlights successes, developments, and insights on this topic. When will critical decisions regarding pipeline maintenance and repair actions be made by computer systems based on machine learning and data analytics for predictive maintenance, rather than by humans? a. It is happening today! b. In less than 5 years. c. In 5 to 15 years. d. It is never going to happen. Please vote within your newsletter. Comprehensive asset care does not stop with operational efficiency activities and the collection of data. It integrates these results from several years to identify behavioral patterns and trends to predict, amongst others, lifetime of assets. This is what comprises the integrity component. At ROSEN we are proud to host one of the largest integrity engineering teams in the industry with several hundred years of combined project experience.